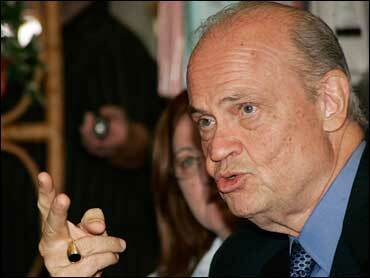 Republican Fred Thompson sidestepped a question about the Terri Schiavo right-to-die case last month, saying he didn't remember the details. On Monday he said he's uncomfortable discussing it because of his own daughter's death. "Obviously, I know about the Terri Schiavo case. I had to face a situation with that in my own personal life with my own daughter," Thompson told reporters. The Republican presidential contender was asked about the case in Florida, where it occurred and where it is still a major issue. "I know this is bandied about as a political issue, and people want to make it such and talk about it in the public marketplace a lot," Thompson said. "I am a little bit uncomfortable about that because it's an intensely personal thing," he said. "These things need to be decided by the family, and I was at that bedside, and I had to make those decisions with the rest of my family." Thompson's daughter, Elizabeth "Betsy" Panici, 38, died in 2002 of an accidental drug overdose, according to the Nashville, Tenn., medical examiner's office. She had been diagnosed as suffering from a bipolar disorder. Panici died on Jan. 30, 2002, six days after being brought unconscious to a hospital emergency room. "I will assure you one thing, no matter which decision you make, you will never know whether or not you made exactly the right decision," Thompson said. "So making this into a political football is something that I don't welcome. And this will probably be the last time I ever address it." He added: "It should be decided by families. The federal government and the state government, too - except for the court system - ought to stay out of it, as far as I'm concerned." Schiavo's feeding tube was removed in March 2005. Congress passed a bill to allow a federal court to review the Florida woman's case, and President Bush returned from his Texas ranch to sign the bill into law. A federal judge refused to order the tube reinserted, a decision upheld by a federal appeals court and the Supreme Court. Schiavo was diagnosed as being in a persistent vegetative state after her heart stopped in 1990. After years of legal battles between her family and her husband, he was allowed to have her feeding tube removed and she died a few days later. On Monday, Thompson was in Tampa to tour the port. Earlier Monday, Thompson visited a flower shop in Celebration, Fla., and defended his campaign work schedule in an interview with The Associated Press. He said his strategy is working and "I'm going to do it the way I want to do it." His absences in early-voting states have been noticed. Thompson hasn't been in South Carolina in more than a month, he scrapped a recent trip to New Hampshire and then canceled a news conference Saturday in Florida. "You can name a lot of places that I haven't been, and you can name a lot of places that I have been several times," Thompson said. "I've been to Florida three or four times," he said. "The mainstream media, with all due respect, likes to concentrate on the process game on a daily basis, and I can't get caught up in that. I'm going to do it the way I want to do it." Thompson pointed out he comes in second among Republicans in most national polls and has more than 100,000 contributors despite making some decisions that defy conventional wisdom. In the interview, as he traveled from Celebration to Tampa, Thompson said he has never behaved as candidates traditionally do. "Some experts, I think, probably expected me to be slicker and better-scripted than I am," said Thompson, a TV and movie actor. "Ironically, I don't follow a script well." He addressed the same issue at Sunday night's Republican debate in Orlando, answering a question about whether he is lazy. Thompson described his trajectory from teenage father to factory worker to federal prosecutor to Watergate counsel and senator, saying, "If a man can do all that and be lazy, I recommend it to everybody." Thompson surprised Republican activists Saturday in Washington, when he left their stage after speaking for about five minutes. Former New York Mayor Rudy Giuliani and Arizona Sen. John McCain spoke for around 20 minutes each, while former Massachusetts Gov. Mitt Romney spoke for about 10 minutes. Thompson suggested it was unfair to scrutinize "what I do every hour of every day." "I hear all the time about people canceling events and things like that, other candidates," he said. "They're not held to the same standard that I am." Thompson said he would roll out specific proposals on issues such as immigration in the coming days. About the Iraq war, he said, "I want most of our troops to come home as soon as they can. My plan for that is to first achieve victory." Victory, he said, is "when normal people can go to worship without fear of being blown up" and "when political leaders can meet without being blown up."